An open source database used for strategic trade control that profiles thousands of entities linked to proliferation worldwide. The Risk Report contains profiles of thousands of companies, government organizations, and individuals around the world linked to the proliferation of nuclear, chemical, and biological weapons, missiles, and advanced military technology. Some of these entities appear on official restricted party lists or are associated with designated entities; many do not appear on public lists but are directly contributing to proliferation or are supporting weapons of mass destruction programs. The database also contains the full text of the U.S. and international restricted party lists, U.S. regulations governing trade in arms and dual-use goods, multilateral export control regimes, descriptions of the commodities controlled by these regimes, analysis of programs of concern by the Wisconsin Project, and additional reference material. Learn more about Risk Report content on the Risk Report website. Who Uses the Risk Report? In some 40 countries, government officials in licensing, customs, law enforcement, policy-making, and intelligence roles rely upon the Risk Report on a daily basis to help make decisions of strategic importance. Some of these countries receive access to the database through support from the U.S. State Department. 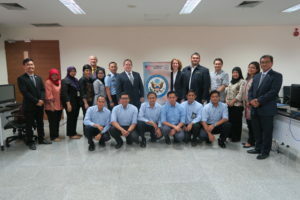 The Wisconsin Project has worked with the State Department for over a decade to conduct training and provide Risk Report access to countries, in order to build their strategic trade control capacity. Companies were the original audience for the Risk Report and continue to rely on the database to screen their supply chain, customers, and clients. Companies have come to realize the potential damage that can come from unwittingly doing business with a restricted party or an entity linked to a dangerous weapon program. The “bare minimum” version of due diligence is not enough to protect companies from such transactions, particularly when weighing costs of a bad decision: hefty fines and reputational damage. Learn more about Risk Report users and subscriptions on the Risk Report website. Wisconsin Project founder Gary Milhollin conceptualized and created the Risk Report. He served as its Executive Editor until retiring as the Project’s Executive Director in 2011. 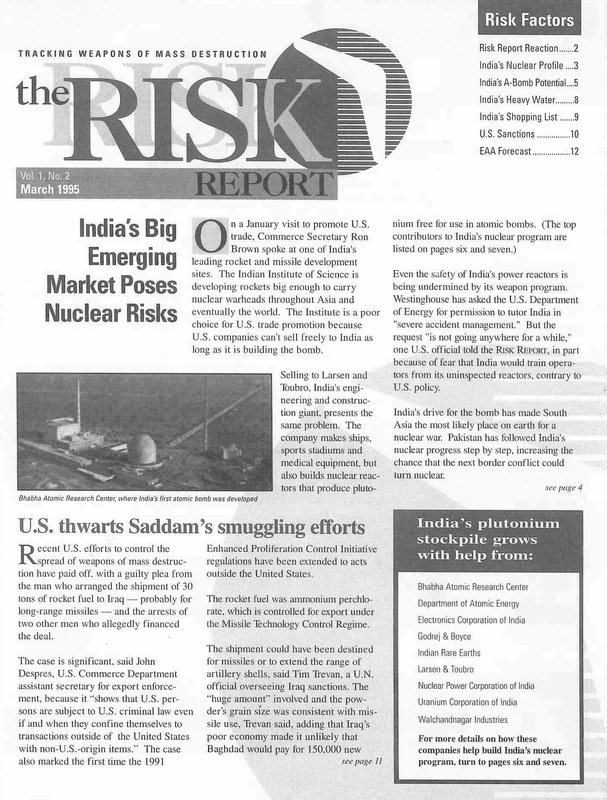 Since then, Valerie Lincy has served as Risk Report Executive Editor. Senior Research Associate Matthew Godsey is Editor of the Risk Report. Mr. Godsey selects and vets all database content, oversees the analysts conducting research for the Risk Report, and is responsible for research on China’s missile and military programs. Research Associate Jonathan McLaughlin conducts research on the entities involved in strategic programs in India, Pakistan, and North Korea, as well as in Russia’s military and missile sectors. He also monitors changes to U.S. and international export control regulations and updates this content in the Risk Report. Senior Associate Meghan Peri Crimmins manages the Risk Report subscriber base, engages potential users, and oversees outreach and publicity for the database. Research Assistant Treston Chandler supports this work. Ms. Crimmins, Mr. Godsey, Ms. Lincy and Mr. McLaughlin train foreign government officials in how to use the Risk Report as part of export control capacity building on behalf of the U.S. State Department. 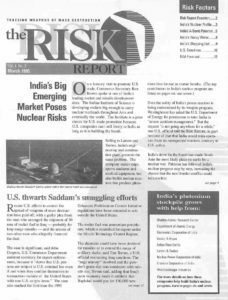 In addition, the Risk Report has benefited from the contribution of past Editors, including Arthur Shulman, Jordan Ritchie, and Gerard White. Ningbo New Century Import and Export Company, Ltd.